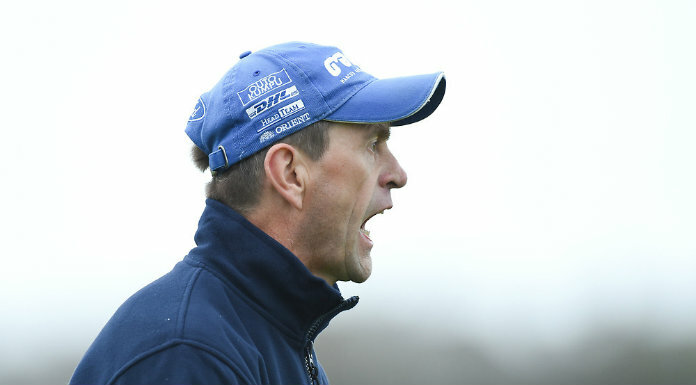 IT was celebration time for Sixmilebridge trainer Niall Kelleher when his Auldthunder ran out an emphatic winner of the first division of the six-year-old geldings’ maiden on the final day of the point-to-point season at Kinsale last Sunday. Racing in the colours of former Sixmilebridge and Clare hurling star Noel Casey, Auldthunder was easy to back at 8/1 but the son of Oscar belied his market position when accounting with ease for his 15 rivals. Charleville-born James ‘Corky’ Carroll rode a confident race aboard the winner who quickened up nicely from two to beat Philip Fenton’s Lowandbehold by two and a half lengths. A delighted Kelleher reported, “This horse had a bit of form going into today and, while I thought he needed a bit of cut in the ground, he seemed to thrive in the better conditions. Corky gave him a great ride and we’ll let him off out on grass for a break now. “I’m delighted for Noel [Casey] and he’s real gentleman and great supporter of mine and racing in general. We’ll bring this horse back in the autumn and he’ll go for a beginners’ chase on the racecourse next,” added Cork-born Kelleher, who was a talented amateur rider in his day. Gort trainer Norman Lee has been making a name for himself this year and he signed off the 2012/13 season in the best possible fashion when his 6/1 shot Supreme Vic scored in the second division of the older mares’ maiden at the Rebel County track. Lee has struck up a profitable rapport with Cork rider Ciarán Fennessy of late and the Fermoy rider did the steering aboard this seven-year-old who stayed on strongly in the closing stages to beat runner-up Everybody’s Dream by two lengths. Traditionally a night of high jinks, this year will see Tubber jockey Derek O’Connor crowned champion point-to-point rider for a record 10th year in-a-row. O’Connor, who has been on the sidelines recently due to a broken leg sustained at Dromahane early last month, will claim the title with a total of 70 wins, 18 clear of his nearest rival Jamie Codd, who, ironically, also missed the final segment of the season due to injury. O’Connor is one of the most decorated amateurs this country has ever produced and his exploits have long made him a household name in Irish racing circles. The stylish pilot, who rode his first winner as a 17-year-old at Killaloe, will be pleased to have retained his title during what was a difficult point-to-point season with so many meetings lost due to the harsh winter. Being crowed champion once again gives him the perfect present as he prepares to marry long-time girlfriend, Carol O’Donnell from Crusheen, at the end of this month. Gordon Elliott opted to send out a strong team between the flags this term and the Meath handler, who recorded quite a big number of winners in Michael O’Leary’s Gigginstown House maroon and white silks, was rewarded when taking the Easyfix-sponsored 2012/13 handers’ title with an impressive tally of 33 wins. Elliott’s partner, Annie Bowles, will pick up the leading Lady Riders’ crown, while Wexford jockey Harley Dunne will receive the novice riders’ award. WASN’T there something surreal about the Investec Derby at Epsom on Saturday? All the pre-race talk was about Jim Bolger’s English 2,000 Guineas winner Dawn Approach and the general consensus of opinion was that the 5/4 favourite would win, if he stayed. The shrewdest of punters were of the view that a hot early pace would be set to make it a sure and thOrough test of stamina over the 12-furlong trip but, in fact, what happened was exactly the reverse. When Aidan O’Brien declared five horses for Saturday’s race, it was expected one of his pacemakers would go off like a scalded cat to try and expose Dawn Approach’s supposed stamina limitations – Bolger’s charge had never run over farther than a mile on his seven previously unbeaten starts. Clearly O’Brien and the powerful Coolmore team that he trains for had other ideas, however, and, in a brilliant tactical move, they opted to slow things down up front hoping Dawn Approach would be keen to get on with things. Ballydoyle 66/1 shot Flying The Flag took the field along in the early stages at a snail’s pace and favourite backers quickly knew their fate as Kevin Manning was forced into almost immediate action to restrain the headstrong Dawn Approach. As the field approached that famous landmark Tattenham Corner, Dawn Approach was taking a fierce hold and soon after, Manning finally lost his battle as he allowed the market leader pull his way to the front. With fully five furlongs to go, it was way too early to be in the lead and, not surprisingly, having burned up so much petrol early on, Dawn Approach soon beat a hasty retreat and was quickly swallowed up. The favourite’s demise left the Joseph O’Brien partnered Battle of Marengo in front but Ryan Moore was edging closer all the time on the wide outside aboard 7/1 chance Ruler of The World with the Tabor/Magnier/Smith-owned son of Galileo powering home to beat the fast-finishing Libertarian by a length and a half. David Wachman’s Irish raider Galileo Rock finished a short-head away in third. This was Aidan O’Brien’s fourth Epsom Derby success and, while his son Joseph, opted for fourth-placed Battle of Marengo, it was clearly a sweet success for the farmer’s son from County Wexford who has filled the footsteps of his previous Ballydoyle-based namesake Vincent O’Brien in no uncertain terms. O’Brien said, “We’re just so lucky that we get these incredibly bred horses and even before they are mated, the dream is for this to happen. The owners understand the game so much, they are given all the information and usually come up with a plan and we try and carry it out. “All the jockeys had their own plan and all the horses were doing their own thing and that is just the way it ended up. This horse was impressive at Chester [winning the Chester Vase] and won like a very good horse,” added the winning trainer. While there was joy for O’Brien, it was obviously bitterly disappointing for Jim Bolger that things turned out as they did for Dawn Approach but the writing was on the wall for the Coolcullen runner from an early stage.